Kennedy Fashner pitches for the Lady Wave in win over the Troy Lady Trojans. 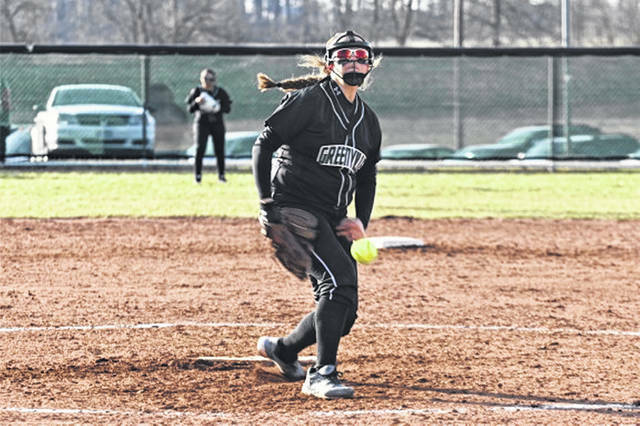 GREENVILLE – Trailing 4-1 after the visiting Troy Lady Trojans finished batting in the top of the fourth inning, the Lady Wave bats exploded for 12 runs in the bottom of the inning to take a 13-4 lead on their way to a 13-6 GWOC win while staying perfect on the season. The Lady wave secured the win scoring 12 runs in the fourth with Nyesha Wright crushing a 2-run homer deep to left for one of the many big hits of the inning. Lani Shilt legged out an infield single to lead off the bottom of the fourth for the Lady Wave followed by a walk to Kennedy Fashner. Haleigh Mayo-Behnken followed with a 2-run fielder’s choice to make it a 4-2 Troy. Lady Wave sophomore center fielder Nyesha Wright drilled a homer to left to give Greenville a 5-4 advantage, its first lead of the night followed by a Zoe Pressnall walk and a Bailey Petry single to left putting runners on first and second. Morgan Gilbert drove a RBI single up the middle followed by 2-run single to center off the bat of Shilt in her second at bat of the inning giving Greenville an 8-4 lead. Mayo-Behnken knocked run-scoring single to center, Allison Powell took a bases loaded walk good for a RBI giving the home team a 10-4 advantage. Pinch hitter Natea Davidson drilled a 2-RBI single to right for a 12-4 score before the Lady Wave would get its 12th and final run of the inning with Courtney Bryson scampering home on a Lady Trojans passed ball. Troy plated two runs in the top of the fifth for a final 13-6 Lady Wave win. Shilt was 2-4 with 3-RBIs and 2-runs scored. Mayo-Behnken went 1-4 with 3-RBIs and 2-runs. Wright was 1-3 including a home run and a walk, 2-RBIs and 2-runs. Gilbert went 1-3 with 1-RBI and 2-runs scored. Davidson was 1-1 with 2-RBIs and Baylee Petry and Susie Blocher each collected singles. Grace Shaffer started on the mound for GHS throwing 1.1 innings while giving up 2-hits, 3-walks and 3-runs and striking out three. Caitlin Christman pitched 1.0 innings allowing 1-hit, no walks and no runs. Fashner threw 3.2 innings giving up 7-hits, recording 1-strike out, 3-walks and 3-runs. With the win, the Lady Wave move to 5-0 while Troy drops to 1-7 on the season. In the Lady Wave eighth grade game, Kylie Hamm struck out 15 Lady Bolts in an 11-0 win over Northmont. https://www.dailyadvocate.com/wp-content/uploads/sites/34/2019/04/web1_Fashner-TROY.jpgKennedy Fashner pitches for the Lady Wave in win over the Troy Lady Trojans.